Bass Products, LLC has been the choice of the best boat builders in the nation for over 30 years. We can supply power distribution systems, communication and control systems, including electrical distribution panels, switchgear and comprehensive monitoring and control. 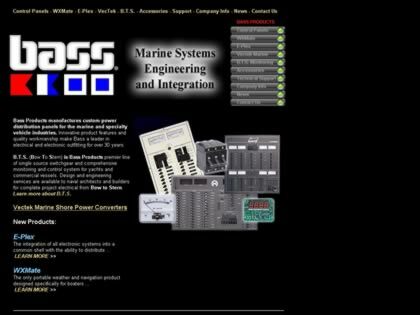 Web Site Snapshot: If available, above is a snapshot of the Bass Products, LLC web site at http://www.bassproducts.com as it appeared when this site was added to the directory or last verified. Please Note that Boat Design Net has no involvement with the above web site; all content and images depicted in the above thumbnail are the property and copyright of Bass Products, LLC unless otherwise noted on that site. Description: Bass Products, LLC has been the choice of the best boat builders in the nation for over 30 years. We can supply power distribution systems, communication and control systems, including electrical distribution panels, switchgear and comprehensive monitoring and control.